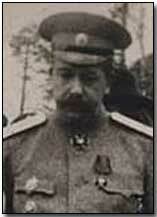 General Nikolai Yanushkevich served as Chief of Staff to the Russian army from March 1914 to September 1915. Yanushkevich's tenure as Chief of Staff - second in command to Commander-in-Chief Grand Duke Nikolai from August 1914 - was notable largely for its incompetence. Despite his role as Chief of Staff, under which he theoretically exercised real power, in practice he exercised little authority over Russia's field commanders. His appointment as Chief of Staff owed as much to his political acceptability at court and to an attractive personality that endeared him to both the Tsar and Grand Duke; he had little to recommend him in terms of a military background. He was generally better regarded as a courtier than as a commander. He delegated much of his role to the Quartermaster General Yuri Danilov, meanwhile attributing military setbacks to a lack of courage among his officers; he also made a habit of persecuting Russian Jews. With Tsar Nicholas II's decision to assume personal command of his armies in September 1915 both Grand Duke Nikolai and Yanushkevich were relieved of their posts. Yanushkevich followed the Grand Duke to the Caucasus Front where they were both effectively redundant in supervising the continuing successful operations of Nikolai Yudenich until the February Revolution of 1917. The Russian Civil War led to Yanushkevich's death in the Caucasus in unknown circumstances.